We have already discussed the elimination of the Zone of Protection for Architectural, Urban and Landscape Patrimony (ZPPAUP) on several occasions, and the fact that they have been replaced by the AVAP (Areas of Value enhancement for Architecture and Patrimony). By creating a commission to study the subject, the Ministry of Culture had given the impression that it was taking over the project but, as we had said here, that was just a lure. In fact, the very complicated procedure spells a step back for heritage protection. Readers will judge for themselves. In order to create an AVAP, the whole process of elaboration needs to start from scratch. The 600 ZPPAUP in France should therefore be transformed into AVAP in the next five years, not very obvious for elected officials in small and medium-sized communities : most municipalities will soon reach the mid-term mark, thus imposing an urgent character on any action ; budgets have decreased while overall costs for studies and procedures is on the rise ; there are not many competent advisors to do the job ; finally, the diminished role of the Architects for Bâtiments de France (ABF) will mean they will play a less important role as compared to the mayors who will not wish to play the game. A significant amount of money and time will go to waste to change (for the worse) something which already existed previously. If the AVAP project is not carried out, the cities will revert to the process in place prior to the ZPPAUP, that is corresponding to the surroundings of the Monuments Historiques and the sites. The regulations which currently apply for ABF advisories are the same for the ZPPAUP and the AVAP. From now on, the procedure will be the following : the architect has one month to give his opinion concerning an application for repairs or renovation. If there is no response, then it will be considered approved. If he gives a negative opinion or sets specific guidelines, and if the mayor does not agree, the latter has seven days to present his recourse at the regional Prefecture. Should there be no response within two weeks (in the case of a change in façade), the mayor’s proposal will replace that of the ABF. If it concerns a request for a permit to build or demolish, the Prefect must answer within thirty days, including the possibility of consulting a local commission. Again, if there is no answer, the application is tacitly approved. As we can see, the deadlines are much too short. The ABF has only one month to make its case. Above all, if it refuses, the Prefect has only two weeks or, at most, one month in the case of construction or demolition permits. Although we can suppose that in most cases the ABF will do its job (unless offices are under-staffed…), there is no way that a Prefect will answer in such a short space of time, especially if the case is a particularly troublesome one. In fact, he need not even contradict the ABF, he can simply bide his time, thus granting his approval. Another cause for scandal : rather than requesting the opinion of the CRPS, Commission régionale du patrimoine et des sites, a committee where heritage specialists were well represented, the mayor will now deal directly with a committee specially created for this purpose, which he presides, and is made up of fifteen people at most, of which only two qualify based on their background in heritage questions. If one includes the Directeur Régional des Affaires Culturelles (automatic member), there will only be three persons who know the subject, and who we hope will defend our heritage. The twelve others will be the mayor, the Prefect, the Directeur Régional de l’Ecologie, de l’Aménagement et du Logement, two figures particularly well known for their skills in “intérêts économiques” [sic] and seven elected officials. In short, the latter will in fact replace heritage specialists. To complete the picture, we should add that penal sanctions have been eliminated, replaced by simple fines. By stripping the ABF of any power, the government has just reduced an important legal measure which protected cultural heritage and which had often proved effective to the point of being used as a model abroad. Finally, we would like to point out that elected officials in Orléans, Serge Grouard, chairman of the committee for the Grenelle laws 1 and 2 (also the mayor), and Olivier Carré (also Urban planning deputy to the mayor) were, along with Christian Jacob, Parliament member and mayor of Provins, the men behind this new reform initiative. 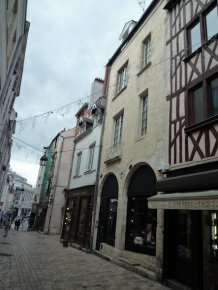 In an upcoming article, we will see how they plan to apply it in Orléans by destroying the southern side of a Medieval street in the city, which survived the bombing of WWII : the rue des Carmes.